Both notes and contact records are searchable, and sortable; keeping this wealth of information at your fingertips by smart phone. 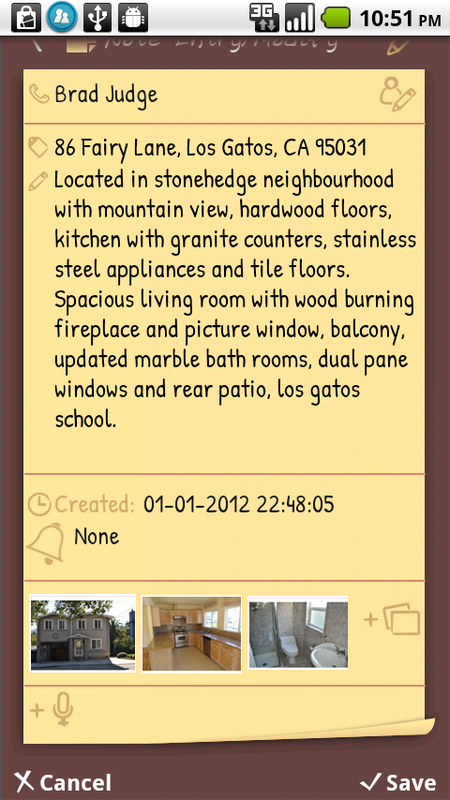 For example matching a new listing with buyers stored as contact, or matching a caller to inventory of homes stored in notes. Keep record of each stage the process is in on the smart phone which can be reviewed periodically to facilitate follow up. Schedule contact follow-up appointments, during a phone call, then automatic posting to the Google calendar as event reminders. These scheduled reminders are also in notes, which could be extracted as a TODO list for the day; allowing verification of outstanding steps and marking for completion. Apart from the capability to capture the information for the buying process on the smart phone, there is the well revered feature of TalkNotes Plus. That is the presentation of the requisite information during call ringing and after call pick-up or during conversation. These are covered in depth in our documentation on Extended Caller Identification and Quick View of contacts notes during call taking. These notes would become part of operational information. TalkNotes Plus provide means of backing up into cloud as well as recovery. In this days of fast moving requirements and offerings the role that TalkNotes Plus plays could be well described by user feedback “helps me to extend my memory and follow up ..”. There is also the operational assist and information presented and kept at the tip of your fingers.